If you aren’t doing so already, you need to learn the main reasons why your employees should be encouraged to use social media in the office. The purpose of most social channels have changed emphatically since say 2008. If you need any proof of that just look at who’s still around. While Facebook has evolved to become the second biggest platform for digital advertising on Earth, sites like MySpace has disappeared. Owing to this revolution, it’s no longer acceptable for employers to see social media as simply as an annoying distraction that must be held on a short leash. It has infiltrated your marketing office, it has infiltrated your sales office and most importantly, it is where your employees are spending around 9 of their waking hours each day – according to Social Media Today. Check out our article on why your personal brand really matters. But ‘infiltrated’ is a recklessly negative word when you consider just how much it has and still continues to contribute to businesses worldwide. Where would your company be without Facebook Ads and Content Marketing? Face it, your business relies on social media. So, now that we’ve accepted that fact. Let’s look at the positives of releasing the stigma and turning your biggest fear (time wasted on social media) into a powerful weapon in your arsenal. Reason 1: Love not war! Let’s get the ugliest elephant in the room out of the way first shall we. No matter what strict measures you try to enforce, the chances are that your employees are going to be checking Facebook, responding to WhatsApp messages and retweeting anyway. We’ve just said that the average person spends 9 hours on them! But before you open a new email and begin penning new employee legislation to ban all electronic devices, let’s flip that reaction and consider making love not war. You were there (maybe you still are) at some point in your career in another meeting and another boss was telling you another thing you couldn’t do. How did it make you feel, was it like another personal right or liberty had been taken away? Did the words “I’m not a robot” cross your mind? Did you feel motivated to be twice as productive for the rest of the day? There’s no joy to be found in fighting the tide, especially at the risk of stifling the creativity and momentum of your amazing team. Here’s what you can do to help gain a comfortable level control of your employees’ social media usage at work, whilst also creating a culture of openness, positivity and progressive thinking. One idea is to create a framework for using social media at work. You can include this is your staff handbook (times it’s acceptable, what channels, etc). But an even better way it to actually encourage a dialogue that helps you land on an agreed set of principles that will work for both your company and your employees. In any agreement, it should go without saying that spending hours sharing memes with your family and friends is a no no – any person who takes umbrage to that probably isn’t worth hanging onto, if we’re being brutally honest. Don’t limit it to specific times and channels either, be creative with how you work as a team and most importantly, how your business can benefit. For example, you might find out that your sales guys actually do most of their lead nurturing on LinkedIn or that your customer service department communicates most effectively through WhatsApp or Facebook Messenger instead of email. If either of these are the case and it’s working, then there’s no need to block it. Let’s look at your content creators too, it can honestly take up to 2-3 hours a day of research to find the best stats or the latest sources of inspiration to help your company’s content stand out online. By limiting them to 30mins or less on websites like Twitter, you’re essentially limiting their effectiveness and therefore their value to your company. Lastly on this point, don’t ban mobile phones! Most of these apps are available on mobile and they’re also specifically optimised to reduce friction, not feed it. Still not convinced about making love not war in the world of social media at work? Social enterprises are 58% more likely to attract top talent and 20% more likely to retain them according to LinkedIn. As we’ve discussed, most of your employees are already probably using their social channels for work without your prompt or approval. Now that you’ve discovered this fact and you’ve accepted it, let’s look at how you can further benefit from it. When you consider what social media behaviours are acceptable at work and which ones aren’t, you (the business) should ask two questions; ‘how can this benefit us?’ and ‘how can we measure its effect?’. The good thing is, if you’ve got an engaged and forward thinking team, they’ve already asked themselves these questions which is why they’re already using the app. If that’s the case, you can create a KPI that will link this activity with their performance. The sales team for example, should be able to track any social media activity back to a sales conversion – like ‘leads converted into sales through LinkedIn’. Companies have already employed WhatsApp as the best channel for internal communication thanks to its more immediate nature compared to emails. Facebook Messenger has become one of the leading resources for customer service, again thanks to responsivity. Would you be able to measure how many issues were resolved or short ticket tasks completed much quicker thanks to these channels? The shear volume of both qualitative and quantitative data you can gather from online behaviour can be astonishing – even overwhelming. But that’s a good thing if more of your employees are using social media at work. It no longer falls solely on the heads of management to find patterns or trends in behaviour if more people are involved in the experience – just imagine how much your lead generators could tell you about customers if they’ve been engaging with them (some might say ‘stalking them‘) online over a period of time. Just think, a marketing director needs to be on the button with the latest trends in advertising (both digital and offline), content marketing, social media, mobile, consumer behaviour (online and offline), customer feedback, sales, PR, IT, finance, and HR! There’s simply not enough hours in the day to know everything. But they can tap into incredible insight from real experiences if they let their team of the leash a little and include them in any social media policy. Hopefully everything I’ve said so far makes sense. But you may still be wondering, ‘where’s the proof?’ So, here are some compelling figures that go a little way to proving how effective a socially active team of employees can benefit your whole business. Your brand – 79% of firms surveyed reported more online visibility once implementing a formal employee advocacy program. 65% reported increased brand recognition according to Hinge marketing. 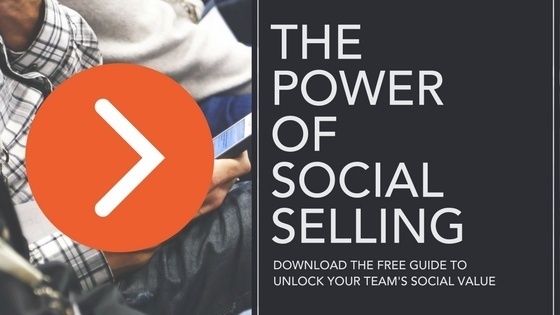 Your Sales – Leads developed through employees’ social media activities convert 7x more frequently than other leads according to Kredible & IBM. Your Marketing Efforts – Content shared by employees received 8x more engagement than content shared by brand channels according to Social Media Today. Your Employees – 86% of employees who act as advocates credit their social media activity as having a positive impact on their career according to Hinge research. What do you think, are you ready to switch gears on social media in your business? If you think of your business departments as ecosystems made of natural parts more than rigid machines with a singular function, you’re already on your way there.